BSNL offering Friends and Family Scheme to Student Special plan subscribers for making all voice calls @ 10 paisa per minute under BSNL mobile services. 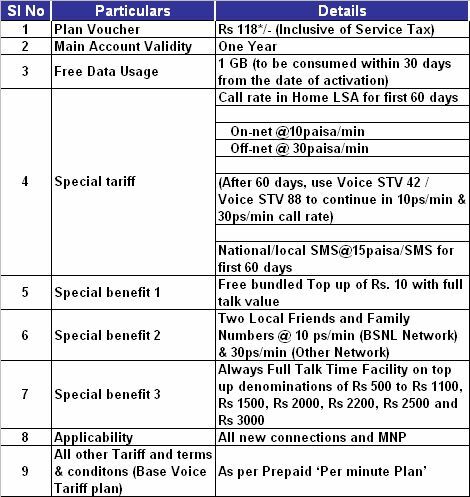 State run Telecom Company Bharat Sanchar Nigam Limited (BSNL) Student Special Plan offers FnF scheme and all outgoing voice calls @ 10ps/min to Student Special plan subscribed customers under Prepaid plans mobile services. The Friends and Family scheme already available in Nestham, Nesam etc. prepaid plans offering reduced tariff vice calls to friends and family number to any network of 5 numbers. Now BSNL planned to get more number of Prepaid subscribers i.e Students customers has decided to add this feature and special benefits to Student Special prepaid plan users. As per latest information, BSNL Competent authority added special benefits to recently launched Student prepaid mobile plan users offering Friends and Family facility @ 10 paisa per minute for two local numbers of any network. In addition customers in Student special plan may enjoy reduced call tariff of outgoing voice calls @ 10 paisa per minute to Local BSNL F and F number and Local voice call @ 20 paisa per minute to other network F and F number. Customer need to register their two Local numbers (within the circle numbers i.e Mobile/Landline/GSM/CDMA) of or BSNL other network numbers under FnF numbers in Student special plan. The FnF numbers can be any combination of BSNL / Other Network Local numbers. The reduced tariff offered under FnF scheme will be applicable in Home LSA (Within Circle) only. Under Student Special plan if number is in Roaming then base tariff will be applicable for calling to FnF number also i.e no reduced tariff will be applicable. The existing other Prepaid plan customers will not be allowed to migrate to this Student Special plan. Student special plan is also applicable in Jammu and Kashmir and North East Circles. For JnK and North East circles, the validity of Student special plan will be 90 days instead of One year. Customers may subscribe to BSNL’s Student Special plan through MNP (Mobile Number Portability) or New Connection. The above features will be implemented with effect from 20th July, 2016 onwards in all Telecom Circles. Student special plan customer will be allowed to use Voice STV 88 and Voice STV 42 with only ‘minute’ pulse option i.e customer in Student plan may continue to enjoy the reduced call tariff of 10ps/min (BSNL Network) and 30ps/min (Off-net) with Special Voice STVs 42 and 88. Voice STV 42 offering all Local and STD calls @ 10ps/min to BSNL Network, all Local and STD calls to other network @ 30ps/min with validity for 21 days. Voice STV 88 offering all Local and STD calls @ 10ps/min to BSNL Network, all Local and STD calls to other network @ 30ps/min with validity for 48 days. Customer can activate the above STV by sending SMS to 123 through Self-care portal using keyword as eg.STV(space)VOICE42 .